Braun, Philips Norelco, and Panasonic. And while I do respect Panasonic, to me the Big Battle is a fierce competition between Braun and Norelco. A rivalry that’s given the world quite a few outstanding products for us gentlemen’s grooming habits. A common misconception I see is people thinking that Braun is better than Norelco, or vice versa. I propose an argument here: it’s not about a difference in quality. It’s about the difference in technique. 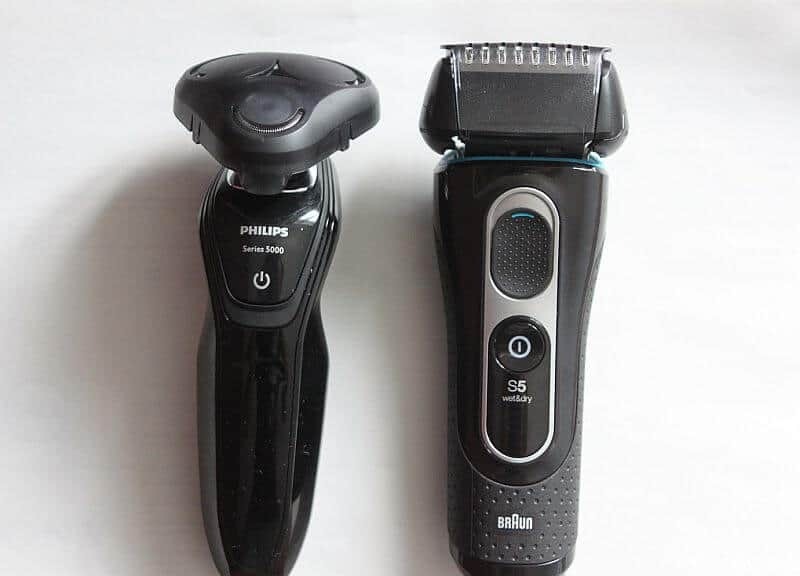 There goes your main difference in Braun vs Philips Norelco Shavers. Braun exclusively produces foil shavers, while Norelco takes care of your hair with its distinguished three-blade rotary heads. With foils, you move back and forth, in straight lines. You don’t do any circular motions, as it’ll cause skin irritation. With rotaries, you do the opposite: going in circles, following the spinning rounded blades as they graze through your hair. Foils tend to shave closer, but my personal experience found that rotaries are gentler on the skin. At least for me – keep in mind that our skin is a fickle buddy. What works for one gentleman might not work that well for another one. The thing is, both Braun and Norelco have extensive product lineups. 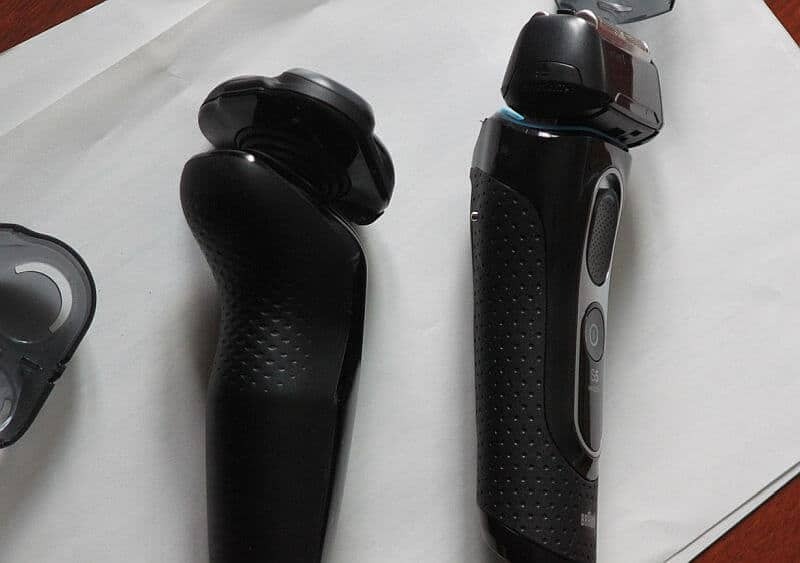 Sometimes the difference between their own series (say, Braun Series 3 vs Braun Series 9 from Amazon.com) is more prominent than how they differ from their competitor. Alright, the basics out, let’s dig deeper into some fundamental parts of what you’d like to see in an electric shaver. Generally, Braun shavers are more powerful. Even the supposedly ‘older’ Series 5 I have spins at 30 000 cutting actions per minute. With the newest Series 9, this gets bumped to 40 000. That’s nothing new: foil shavers usually put out a better performance than rotaries like Norelco. Especially if you count Braun Series 9’s AutoSensing motor that’s the top performer in the industry. This helps for extra thick hair or those of you with really curly facial hair. 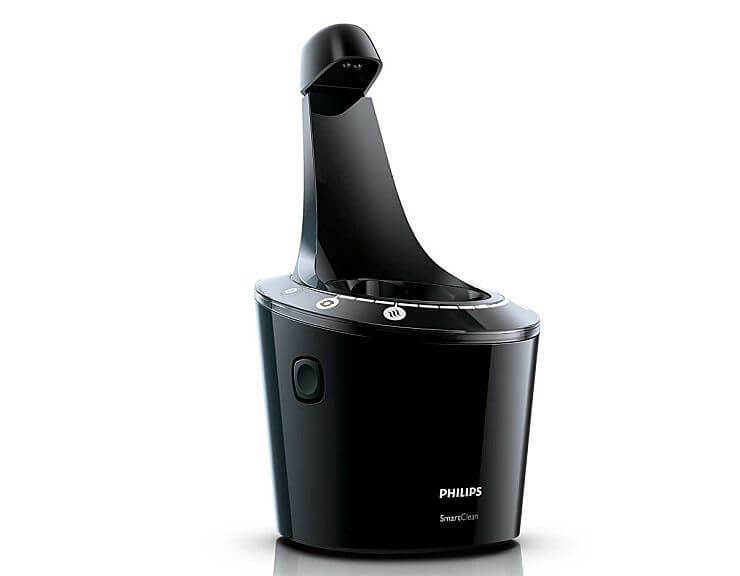 The downside in Braun vs Philips Norelco Shavers? Well, a more powerful shaver will also be way noisier. This power is pretty important. It actually ends up easier on your skin as you don’t have to keep going over the same spot multiple times to get a closer shave. The fewer passes you end up doing, the less irritation your face will have to endure. And since there a lot of guys out there that still won’t go near an electric razor for fear of how harsh they are on the skin, the power then becomes essential. Which is why, in general, Braun shavers are louder than your average Norelco one. This is a very, very tough factor to cover. The reason is, even among their product line up, both brands change the blades quite a bit. I can’t put a SH90/62 newer blade technology on my Norelco Series 5000 with its SH50/52 blades. So, what I propose we use as a benchmark here are the directions which the blades utilize when shaving. Put simply, the more directions, the better shave. 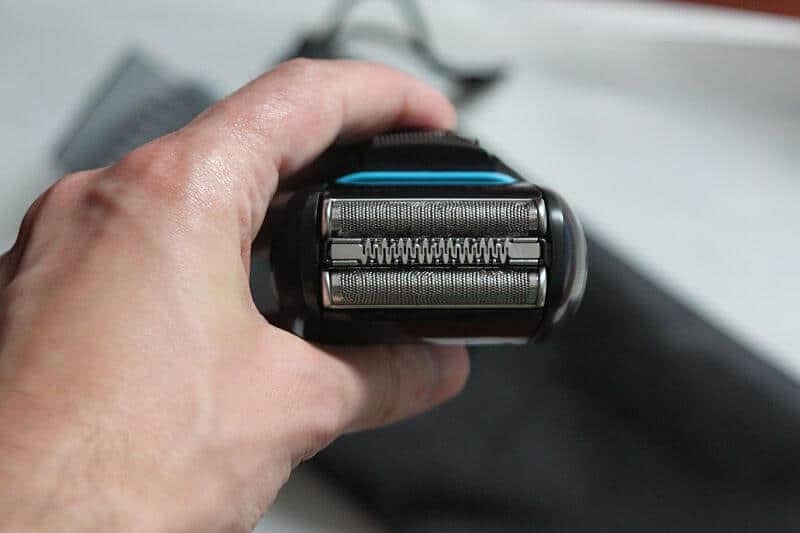 Having more directions means the blades can approach the hairs from different angles, providing more accuracy and reducing unfinished work that might lead to ingrown hairs, bumps and other unpleasantries. This also leads to less irritation as I mentioned earlier that the less times you need to go over the same spot, the less likely you will end up with razor burn. 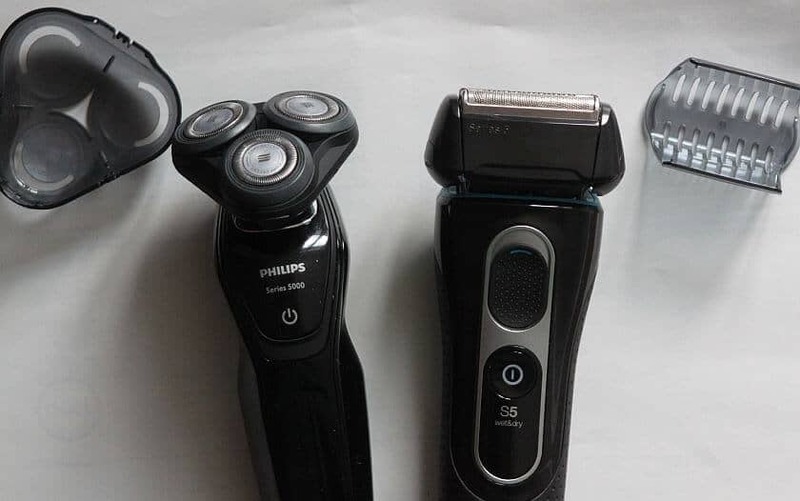 I’ll be honest with you about Braun vs Philips Norelco Shavers: anything above 5 directions is pretty good already. But there’s something called ultra closeness, and some gentlemen do want their dose of luxury, flawless shaving. Braun wins over Norelco with its Series 9 foil shaver here. The brand’s latest, it features a stunning feat of 10 directions which is a total record in the world of electric shavers. It’s simply unmatched. 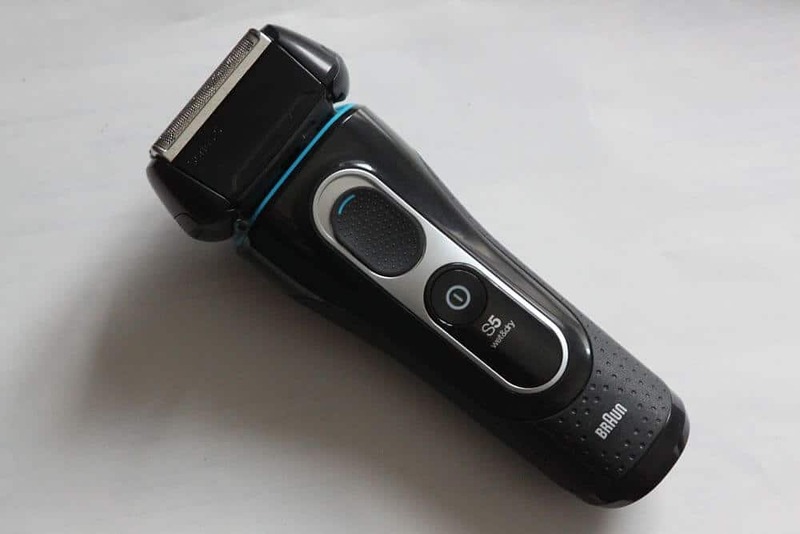 Series 7 and 5 are on par with Norelco’s 8900 from Amazon.com or 9700 Series – exactly 8 directions, which is a very smooth, high quality shave anyways. The Norelco rotary I use, being a bit older, spins ‘only’ in 5 directions. Sure, I do get a bit of a better job with my Braun, but even 5 directions is plenty. If you have thick hair, once again you’d want as many directions as possible. But if your facial hair is straight and thinner, even 5 directions will serve you well. I’ll be honest on Braun vs Philips Norelco Shavers: the older Norelcos are pretty bad with wet shaving. But if you pick a newer model, they’re on par with Braun’s lineup. Still, I think foil shavers fare a bit better if you’re using a thicker shaving gel/foam, especially if you use a lot of it. Keep this in mind depending on your shaving habits. A nice in between is to use preshave oils and creams specifically for electric razor shaving. All you need is a very thin layer to smooth out the experience. If you don’t like doing dry shaves but at the same time are not keen to deal with globs of shaving cream or sticky gel, then you should think about using one. Then again, I’m more of a dry shave person. Remember to always sprinkle a bit of witch hazel (better than aftershave) to reduce irritation or razor bumps. Obviously, both brands tout their proprietary technology in every aspect. V-Track Precision for Norelco’s blade system; Sonic Technology for Braun’s. But I already talked about blades, so let’s take at two other deciding factors: battery and maintenance. Times have advanced to the point where you can’t imagine using a corded electric shaver. Oh, the inconvenience! To cater to demanding people like you and me, both brands’ newer lineup has migrated to being cordless. Lithium-Ion batteries and quick charges make sure we’re not left alone (and possibly naked) in our shaving routine. In terms of battery life, the difference is negligible. A standard for both Norelco and Braun is a 50 minute battery life on 60 minutes of charging. Interestingly enough, some of the Series 5000 Norelco hold 60 minutes! In other words, either one will give you more than enough battery time for at least three or four shaves before you need to recharge. If you are taking 50 minutes to do a shave and feel like the battery doesn’t last long enough, then you are definitely doing something wrong! Perhaps it’s the less powerful motor in motion? What I like about my Norelco is that it has a Quick Charge function. Basically, if you forgot to charge it, you can plug it in for some 5 minutes or so and it’ll come out ready for a quick shave. My Braun doesn’t have such an option. By maintenance, I’m talking about the cleaning systems newer shavers come with. Generally, a cleaning system has three responsibilities: to clean, to charge, and to lubricate the blades. That’s right, Braun and Norelco decided to go all techie and combine cleaning plus charging in one so it’s more compact and easier for you and me to shave properly. The Braun Series 9 and Norelco 9700 from Amazon.com introduced another feature: their cleaning stations also dry the blades after they’ve finished with the other tasks. Who knows, in the future they’ll also provide us with a hands-free grooming session, huh?! Anyways, both brands have top quality cleaning system. They really do. Braun cleaning stations use an alcohol-based solution to kill the germs and refresh the blades. Norelco’s cleaning agent is alcohol-free. My skin has no problems with either of these, so I’m all set. However, I’ve heard of very sensitive skin that might be in a no-no situation with any alcohol-based liquid. Now, Braun have made their incredibly soft and diluted and it shouldn’t be an issue – I’m just informing you of the main difference. If the blades are dry then it is almost a non existent problem that your skin will react the the alcohol from the blade disinfectant. As I mentioned, objectively there is not a winner, or a loser in this curious electric shaver case. It all boils down to your personal preferences and characteristics like skin sensitivity, thickness of your facial hair and similar factors. What I especially want to say is that it’s not always that you need the most expensive model. A medium-budget pick can work well enough. I hate to sound wishy washy about it, but it basically boils down whether you prefer a rotary or a foil electric shaver. Braun are the best for foils and Norelco makes the best rotary. Either brand does a great job and last a long time. The reason I got both a Norelco and a Braun is because I’m interested in everything clippers, trimmers and shavers related. I use my Norelco for shaving my head, and my Braun for taking care of my neckline and sides when I’m in the mood for a clean shave. But I could easily use any of them for both my scalp or facial hair. I’m just a little bit crazy re: grooming tools. In other words, both brands’ lineups are something you wouldn’t regret as a purchase. Just think about your preferred technique and make the choice. Hope my in-depth comparison helped, if a little bit! Salon Recommended: 5 Best Professional Shampoo Brands to Look Out For! I can’t thank you enough for this spot on comparison for these styles and brands. I am in the market for a new shaver, and I really wanted to make an informed purchase. Based on your info and my facial hair, I think I am going to make the switch to a Braun and try the foil blade style. Here goes nothing! We’re so pleased that we could help you out! Don’t forget to check back and let us know what you think of the Braun! Wow! Spot on and exactly what i was looking for. Thanks for your thoughtful review! I have a Norelco shaver but tried a Braun over Christmas because it’s what was available. The Braun was louder but shaved far more quickly and seemed to shave every bit as closely as the Norelco. Which made me think it’s time to go shopping for a Braun shaver. Re: Remington? I don’t have a clue. Never used one. Hi. I have one question. Is this kind of shaver an option if what I want is not a very close, razor-like shave but more like a 2-day look? No, you won’t be able to use a razor for that. What you can use is either a beard trimmer or a hybrid like the OneBlade Pro by Norelco.